Don’t you like having a thousand of something? Yeah, same here. 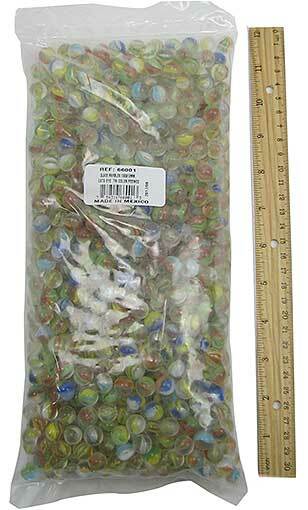 We recommend this bag of 1,000 (we did the math, that's only 2.4 cents per marble) glass cat’s eye marbles in a rainbow of colors. Called Peewees in the marble world, they’re 12mm dia, which is 0.47”, which is like a really big pea, or a really small garbanzo bean. 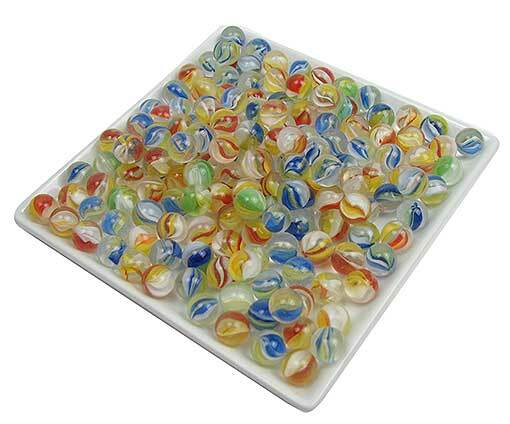 Play mini-marbles, or make clay cats and use the marbles for eyes, or just keep them in a big bowl for their prettiness factor. You take the Moo Popper, an open-mouthed 6" tall rubber Holstein, stick one of the (6) 1-1/8" dia chartreuse (or grass-colored?) 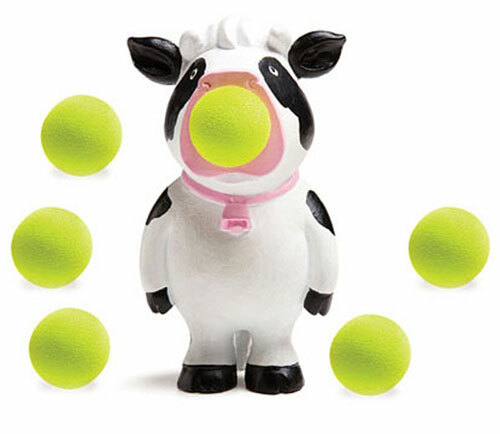 foam balls in its mouth, give its bovine belly a good squeeze and it expels the ball across the room. Harder you squeeze, farther it flies. 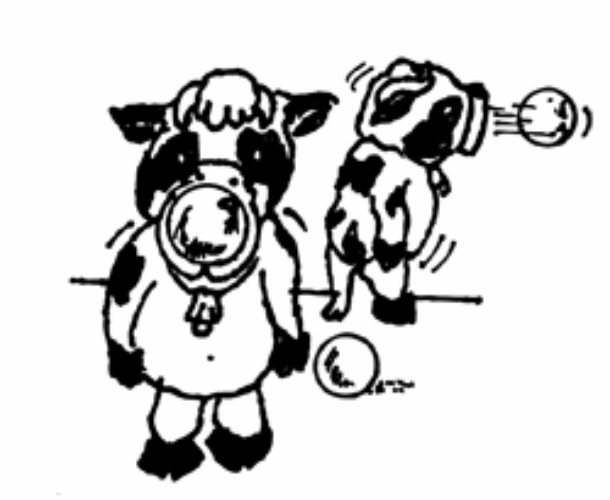 Impressive ballistics, good clean fun and an educational look at dairy farming practices all at the same time. Sorry, no fully automatic cows are available. It's a toy! It's a scientific demonstration! 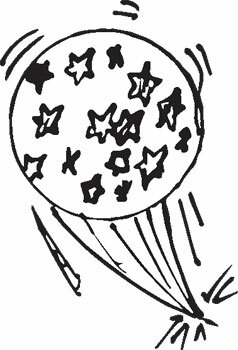 Drop the 1" ball with a straw attached and watch the outer rocket straw launch. 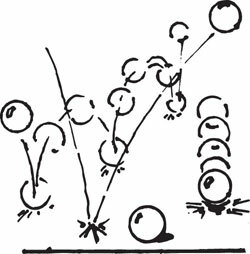 The farther you drop it, the higher the launch, which is the fun version of Newton's Third Law of Motion. 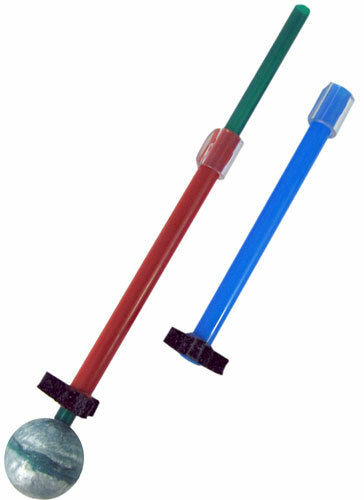 And we give you (2) rocket straws on account of we know you're going to lose one. 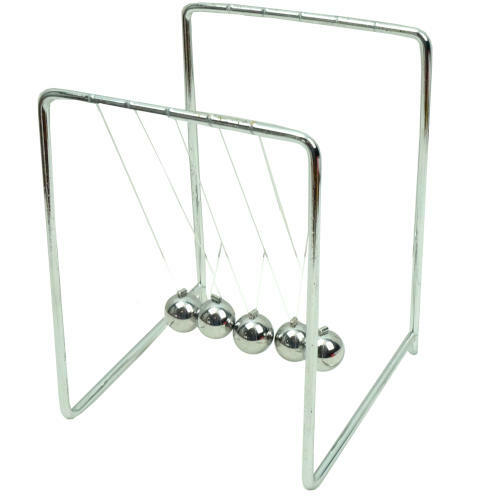 Perfectly suitable for all your non-professional ping-pong-ball applications. 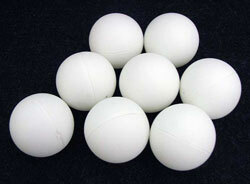 These guys are white-ish, with a visible seam, and are 37mm in dia, as opposed to the standard 40mm or the former standard 38mm professional ping-pong balls. Priced so you can buy enough to do any number of clever things with them. 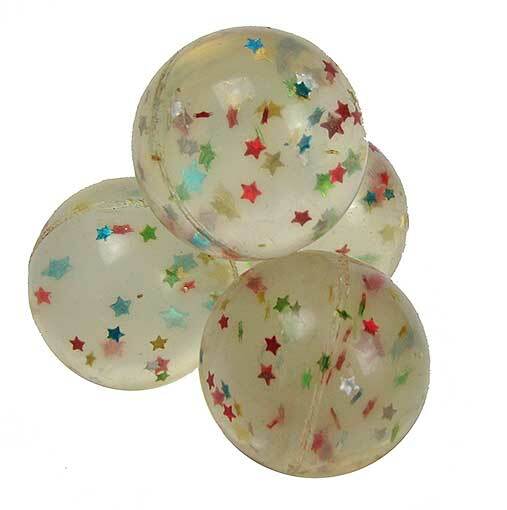 They’re festive because they have multicolored tiny stars suspended inside of them, so bouncing them is extra fun. 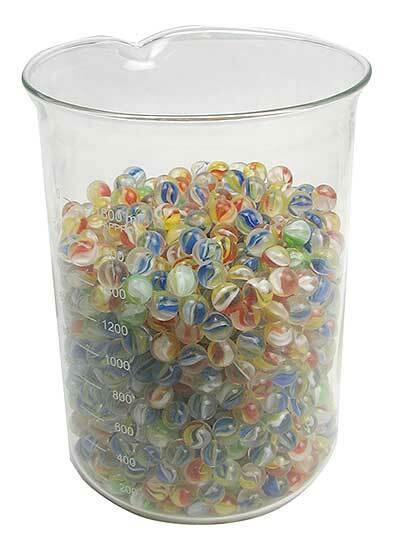 In a golden-ish clear color, they measure 1-1/4” dia. 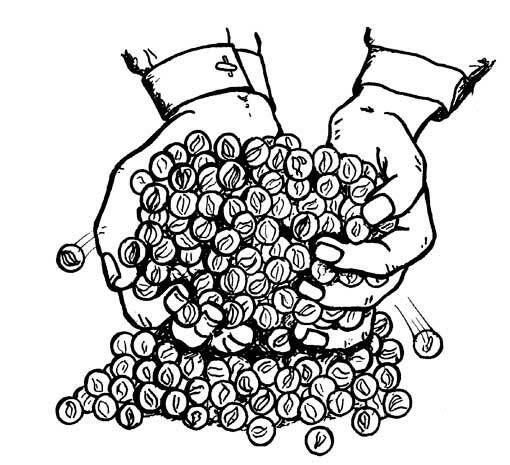 You'll receive a bag of (12) balls, because a couple will probably disappear to the same place those missing socks have gone. Squeeze your stress away with this squishy ball in bubble gum pink, with the added aroma of bubble gum. 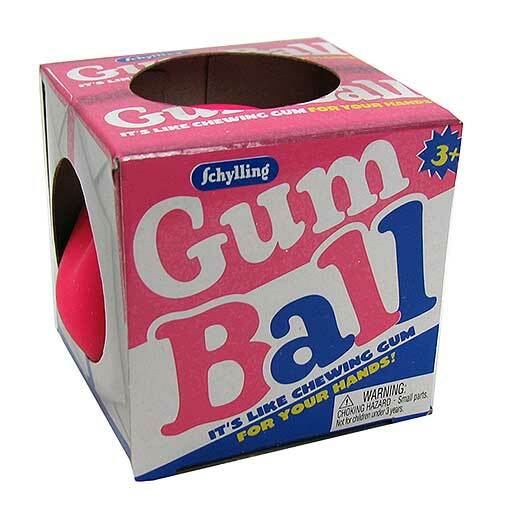 Like the real thing, your bubble gum stress ball may lose its flavor after a while, but your stress will be gone, too. 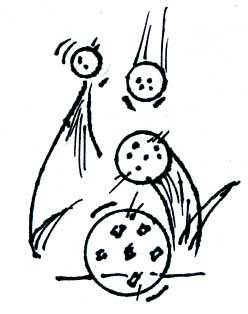 And when it returns, just squeeze that ball again. 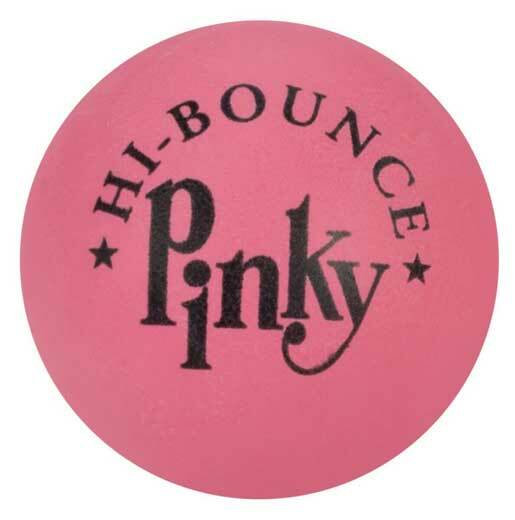 Don’t confuse this 2-1/4" dia “Pinky” hi-bounce latex ball with that pink ball used in New York since time immemorial for stickball, stoop ball (pinners in Chicago) and other venerable street games just because it looks and acts the same. Not quite super-ball category, but plenty bouncy. 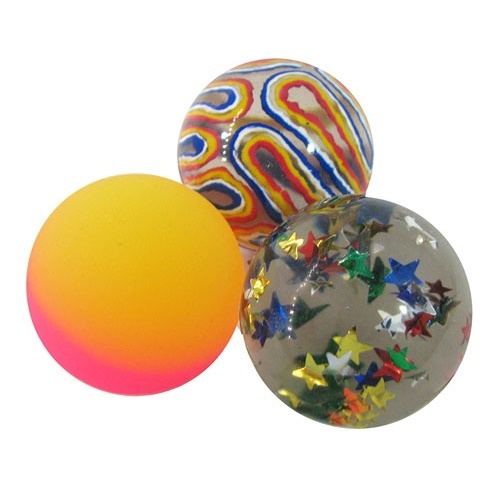 We’ll send you (2) different orbs ranging from see-through with a bunch of glittery, multicolored stars inside to covered with swirled colors reminiscent of Munch’s The Scream or pink and yellow like a tropical sunset. All of which are super by themselves. Measures 1-3/8" dia. Together again and not available in any store we've ever heard of. 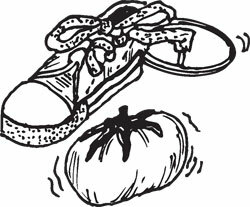 Our party favors set includes an improbable 2" dia squishy egg with yolk, a similarly sized squooshy tomato, a 3" long high-top gym shoe-key chain, and a nice set of joke partially rotted upper teeth. 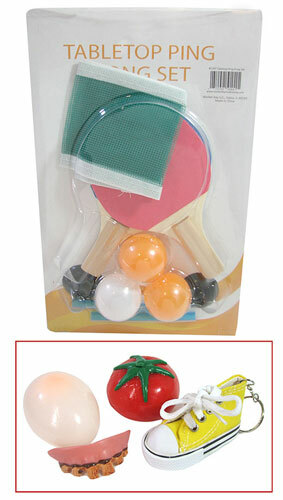 Add the world's smallest ping-pong set, including (3) standardish balls, (2) tiny paddles and a mini-net for our deluxe set! Just try to find them anyplace else for our price! 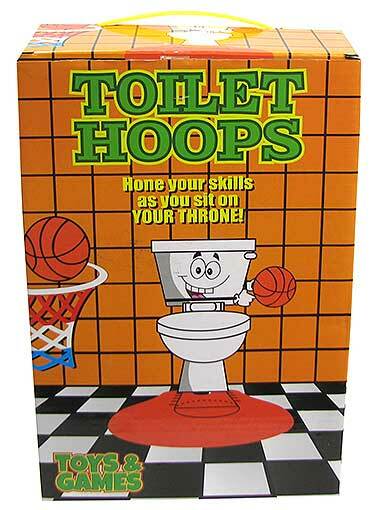 The manufacturer calls this Toilet Hoops, but we have too much dignity to print that. 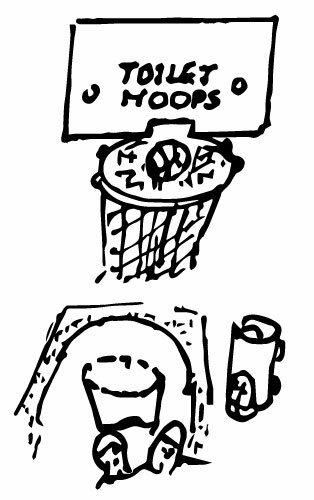 It’s a 5-1/4” dia suction-cup-mounted basket and backboard, a 27” x 30” felt court for the floor, (3) 2-3/4” dia basketballs, and a holder for the balls that you can mount near the toilet so you can be like Mike. Includes a “Do Not Disturb” sign for the bathroom door.